Houses & Homes VA: Too Much is Too Much! As a realtor I get to see a lot of homes. As we all know when you are trying to sell your home staging is vital and first impressions are everything when perspective home buyers pay a visit. One thing that will make any home look sparse and bare is empty walls. Have you ever seen a home with nothing on the walls? No pictures, no artwork, no décor of any kind? It really gives the impression of “emptiness” and makes the home feel uninviting and lonely. But there is one thing that’s just as bad as bare walls and that is too many pictures! I’ve written many times about how important it is to de-clutter your home before showing it to buyers. A neat, clean well organized home is something that every buyer wants and it is nearly impossible to sell your home if it is disorganized or “junky”. This applies to the walls just as much as every other part of the home. Here is a simple “rule of thumb” when it comes to having too many pictures on the walls: if you feel like you’re being watched than you have too many pictures! Here are some great guidelines as to how to hang pictures properly in your home without overdoing it. Quality not Quantity – Whether you choose to adorn your walls with loved ones or prefer a more “artsy” décor, use good judgment. One interesting picture is better than 100 every day photos so choose wisely and hang pictures that are unique, different and interesting. Adding character to your home will make it more interesting and a good conversation piece is priceless! Family Pictures Have a Place – I have noticed that many people like to place pictures of loved ones everywhere throughout their home. 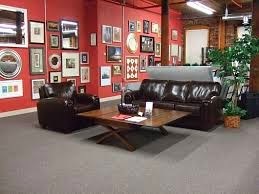 The truth is that the best place to place pictures of loved ones is probably in the family room and living room. It just makes sense in those places. Others can still see them and when you’re selling your home visitors expect to see them in these areas. Home Offices – If you have a home office, library or den in your home this is the perfect place to hang awards, diplomas, business documents and pictures of business associates and the like. It’s a great way to show “who you know” or what you know but placing these types of photos and documents in the more public areas of your home can easily give the impression that you are “showing off” to visitors. Believe it or not such a simple thing can even cause buyers to be “turned off” by your home and no longer be interested in buying it. I know that may seem a bit silly but people can be fickled and even the smallest thing can have an impact on their mood or general impression of your home. A Place for Everything and Everything in its Place – Common sense is always a good idea and placing the proper pictures in the proper place can give meaning and purpose to every room in your home. After all, who wants to see pictures of food in the bathroom or deceased relatives’ pictures in the kitchen? Remember the importance of colors as well: red and orange are great in “high energy” areas of the home where you intend to entertain guests and calming colors such as pastels work well in bedrooms and patios. Where you place pictures together on a wall also can make a big difference. If you want to highlight a certain photo (such as a picture of your grandparents) you can make it the centerpiece by placing other family photos around it. Adding a large frame or even a table easel will increase the impact that much more and can do wonders for the décor of that particular room. I’m sure that if you take the time you can think of many ways to display photos and artwork throughout your home in a very tasteful and attractive manner. The bottom line is that too much of a good thing is just too much and can make selling your home more difficult.